If there is one summer item that we cannot get enough of, it is a classic long skirt, which we always look cute in. 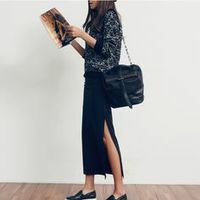 Whether we decide on a boho style with patch patterning that harkens back to the hippie flower child days of the 1970s, or one that is a bit sleeker and sexier with a straight cut, a lengthy skirt is ideal. Celebrities from Katy Perry to Selena Gomez have been seen looking pretty in floor grazing skirts, which is yet another reason why we love them. So whether we are after a bohemian look for the summer, or something more elegant, a long skirt is an item we love.